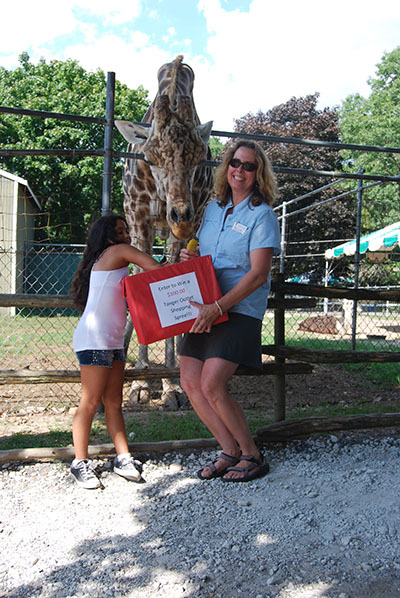 Madison Salimullah, age 10 of Dix Hills, assists Clifford the Giraffe and Melinda Novak, Owner of the Long Island Game Farm, in selecting the winner of the Tanger Outlets – Riverhead $100 shopping spree during the park’s Back to School Blast on Saturday, August 29. As a final summer hurrah, the Long Island Game Farm hosted its Back to School Blast on Saturday, August 29. Hundreds of visitors, including some from across the country, traveled to the park to experience reduced admission prices, face painting and all of the zoo’s traditional exhibits and shows. The guests also were presented with giveaways, such as notebooks from Staples for the first 100 guests and coupon books from Tanger Outlets Riverhead. The mall also gave away one $100 shopping spree to Solomon Yakubov, of Fresh Meadows. He also received a stuffed giraffe courtesy of LIGF and in honor of the zoo’s mascot, Clifford the Giraffe. The 25-acre Game Farm features interactive animal experiences, in which guests are able to get up close and personal with their favorite animals. This year features its newest attractions: the Camel Encounter, where guests are able to hand-feed camels and learn fun facts from staff, and the Priceless Parrot Encounter at the Discovery Center. In addition, guests are able to hand-feed the Game Farm’s resident giraffe and bottle-feed baby goats and other nursery animals.